It’s obviously a very exciting time of the year for footy fans. The Brownlow Medal count is just one week away and we’ll know who takes home the Premiership cup just 5 days after that! It’s been another fantastic season of football and this weekend, the semi finals, will be very interesting. We’ll be there to help you out if you want to grab some extra gear to support your team, so if you’re looking for AFL merchandise, we’ve got your back. The Fremantle Dockers have performed at a high level all season, and you’ve really got to tip your hat to coach Ross Lyon for implementing the defensive game plan that has made them so tough to beat. They are tipped by many to take care of last year’s premiers the Swans for their first ever grand final berth. Meanwhile, the Hawks – who remain the Premiership favourite according to the bookies – will have to defeat the team that has beaten them in the past 12 meetings since Hawthorn got up against Geelong in 2008 grand final. You’d think the Cats would have the mental edge in this matchup, but the Hawks have been brilliant all season and will be very difficult to beat. The All-Australian team was announced earlier this week, and like most years, there has been some discussion and debate in regards to who was deserving of a place, and who was possibly overlooked. More often than not it’s a given team’s supporters that point out when one of their players has been given the cold shoulder by selectors, though there are some legitimate shock omissions that most in the football world are wondering about. Though it was great to see 12 debutants make the side and Gary Ablett break the record for the number of consecutive selections (7). Luke Hodge is one whose non-selection is nothing short of baffling. The Hawks star captained the best team of the regular season and had a great year playing off half-back. Fellow Hawk Sam Mitchell – who was moved into a sweeping role this season – got the nod as did Coleman medallist Jarrod Roughhead. Lance Franklin probably played second fiddle to Roughhead most of the year, though they both managed to average the same number of goals (3). The Tigers, who were knocked out by Carlton in the opening week, expressed confusion that they finished 5th yet didn’t have a single player in the All-Australian squad, let alone the final team. They certainly have a point. Trent Cotchin managed 26 touches per game and had a very consistent season and even Daniel Jackson, who many are tipping will walk away with the club’s best and fairest, had a great end to the year. Nathan Fyfe of Fremantle is another that possibly deserved the honour – finishing with an average of 25.7 possessions per game and 6th in the contested ball stats. It is however, difficult to see which players you’d bring out of the side. Ultimately, it’s not easy splitting the best players in the competition and there were likely many deserving players than only missed out narrowly. We’ll be excited to see who will take out the Brownlow, though Ablett remains the strong favourite. And after that it’s on to the biggest day in September! The most exciting part of the footy year is here and the team at Spectator Sports Online couldn’t be more excited! Over the next 4 weeks, the best teams in the AFL playoff for the premiership cup. As always, we’re predicting a fierce, intense finals series. Many feel as if the mob from down Glenferrie way are a shoe-in, but the teams in the top four are relatively close and each of Freo, the Cats and the Swans can beat the hawks on their day. If you’re headed to the finals, you’re obviously in for a treat! Plus, you’ll want to look the part so jump on our website for the biggest range of AFL merchandise with your favourite team’s logo and colours. In this article, we look at some of the year’s biggest stories to help you remember what a great, exciting season of AFL it was! Without a doubt, the biggest headline has been Essendon’s supplement program, and the subsequent penalties handed to them by the AFL which cost them a place in the final eight. 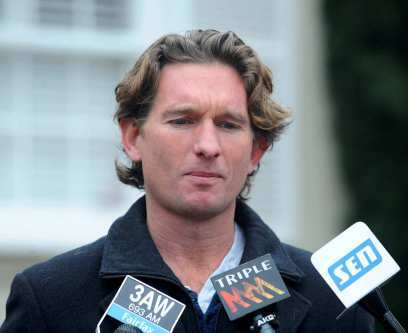 Coach James Hird will be taking 12 months off, and there is probably a good chance that he won’t be returning after so long out of the game. This situation has ultimately shown us that our league is in the same boat as many other world sports; we are not immune from the drug problem. It has also probably prepared the AFL and put them in a position where they are able to deal with any future problems. Two players from the AFL’s two newest clubs have shown real promise, and we and many footy experts are predicting amazing, long careers from these young lads. Rising star winner Jaeger O’Meara averaged 21 touches and 5 tackles in his maiden season, which included a huge 3-goal performance in a win against Collingwood in round 17. The 19 year old from Perth has amazing balance and strength for his size, and he seems to have a veteran’s understanding of the game even in his first season! Meanwhile, Jeremy Cameron has been turning head over in Greater Western Sydney. At just 20 years of age, he booted 62 majors and experts are talking about him being the next Wayne Carey. Fremantle Dockers coach Ross Lyon has mentioned that he’s a freak and destined for ‘special things’. It’s certainly looking like he’ll have a fantastic career and all eyes will be on him in 2014. Tigers fans haven’t had too much to smile about in the past few seasons; prior to 2013 they had finished in the top eight just twice since 1987. Many believe that this talented young team possibly should have been more successful earlier, and it’s been narrow missed chances and big games not going their way that have cost them. But the Tigers really showed what they’re capable of this season and stayed consistent throughout. We’re truly perplexed how none of their stars managed to make the All-Australian Squad! They’ve got a solid midfield with Cotchin, Martin and Daniel Jackson stepping up in a big way this season, not to mention their devastating forward line with the likes of Edwards and Riewoldt both having fabulous seasons. It will be interesting to see how far coach Damien Hardwick can take them.